Author note: Davy is a charter member and former President of MAPPS (Mississippi Association of Professional Process Servers. Davy is a 20-year veteran of the process serving industry and owner of Quantum Process, LLC (formerly Keith Investigations, LLC). The question of providing a “court approved” proof of service has been a topic each year at our Mississippi Association of Professional Process Servers (MAPPS) since its inception in 2010. The proof of service provided to your client is essentially the final product that you offer for services rendered. It is of utmost importance that such proof of service is rendered with zero errors. It should be as close to perfect as possible. What will “get by” and what is “correct” are absolutely two different issues. It is important to understand that proofs of service in state courts within the United States usually have their own approved has their own approved form and this tractate is limited to providing a correct court approved proof of service for Mississippi Circuit, County or Chancery Court. Over the past 20 years of service process, I have gained the knowledge and understanding of what or which form to use for a Mississippi Summons in regards to a proof of service that complies with the form provided in Mississippi Rule 4. The form proof of service listed in “Forms” in Mississippi Rules of Civil Procedure was adopted by the Mississippi Supreme Court Rules committee March 1, 1985. The latest revision was made March 17th, 1995. This form was designed to be copied on the back of any summons issued in any Mississippi Circuit, County or Chancery Court Summons. The form is titled, “Proof of Service-Summons.” In my opinion, this form has a few issues. The first issue I will discuss is that there is no area to include additional documents served in addition to a Summons and Complaint. Often, there is discovery, interrogatories, exhibits, etc that should be listed as served in conjunction with the Summons and Complaint. This form is also lacking the address where such person was served. Often, a summons will have the wording “or wherever he or she may be found.” The issue of where such person was served is a question that comes up in court and / or with counsel involved in the case. As previously stated, the form proof of service is designed to be printed on the back of the Summons. This is problematic when the Summons and other documents are served at an alternative location or address than what is provided or listed on the summons. ​With this form, there is no place for the server to enter the address where the papers were served when it was served at another address unless the server alters or hand writes another address on the summons or makes notes on the back of the summons on the approved form​. Both of these options are a poor choice as no summons should be altered in any way after service. The form also has a section to provide the server’s social security number. Due to security and identity theft, no court in Mississippi requires that this information be put on a proof of service that is available for public record. Summons are routinely now being filed electronically. It is no longer necessary to have a “wet ink” summons accompany the proof of service filed in any court in Mississippi. In fact, this causes issues when an attorney or other person sends all of their original summons that were issued by the clerk to the server so that a proof of service may be completed on the back of the summons. If the original “return” summons is misplaced, complications may result as some clerks may or may not keep an original summons on file. There is no law or restriction serving a validly issued “copy” of a summons. Therefore, in my opinion it is not a requirement of Rule 4 to serve a summons by the clerk of court, and / or wet ink seal from the clerk. 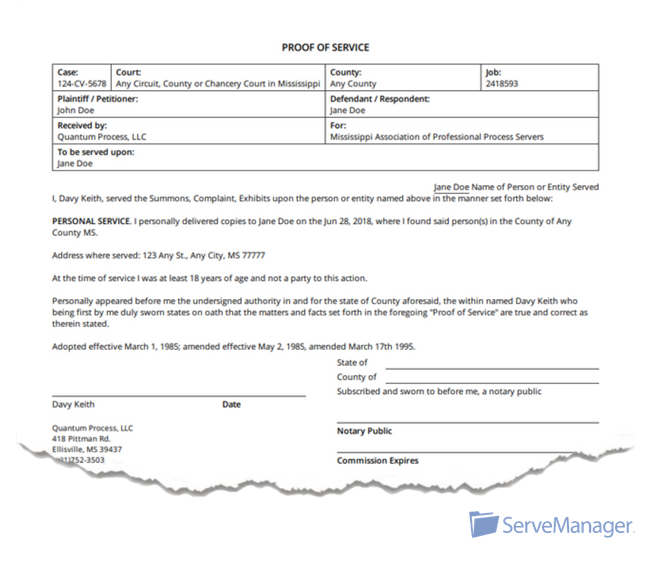 In my experience, it is now common practice in all Mississippi state courts that a proof of service may be a separate document ​without having to be printed on the back of an original summons​. In conclusion, Rule 4 only gives a form example of the proof of service. I believe that keeping the original wording and language provided in Rule 4 along with all the information requested on the example form, the additional information I have mentioned here is the best practice in providing a proof of service. Davy Keith with Quantum Process, LLC designed and submitted a proof of service to be used in any Mississippi Circuit, County or Chancery Court that replicates the language and format of the original approved form proof of service previously mentioned. The proof of service covers the issues mentioned previously such as the address where the papers were served along with removing the Social Security of the process server from the form. This proof of service is a “stand alone” proof that includes the style of the case, exact documents that were served, along with needed information. In other words, this proof of service supplies all the required information and more. The wording was copied word for word in regards to the language adopted in the approved form as well as the general layout of the form. There are two separate forms that are used. One that reflects in hand personal service and one that reflects what the approved form calls “residence” service. Since these forms are prepared each time, electronically, there is no reason to have both methods of service listed when only one was achieved. It is important to note that if residence service is obtained, the date of the mailing required by Rule 4 must accurately reflect the date that the papers were mailed, first class postage pre-paid, to the address where the papers were served. This date usually is populated to the date that the papers were served. If this date is after the day it was served, the day must manually be changed so that the proof accurately indicates the date of the mailing of the copies after service. These proofs of service were presented to the board members of MAPPS and were approved as the best proofs of service to use for Mississippi Circuit, County and Chancery Court as they not only comply with the needed language offered on the approved form but also include additional information that allows the proof to be presented as a stand alone document not required to be printed on the back of the summons served. MAPPS recommends that any service validly issued in any Mississippi Circuit, County or Chancery Court use this approved form for all proofs of service served personally or with residence service. These affidavits are also available in ServeManager. If you have a ServeManager account and you want access to these proofs, please contact ServeManager here to make them available in your account.